Senior Libby Morris is the director of the Lilting Banshees, which is Wake Forest’s only sketch comedy troupe. 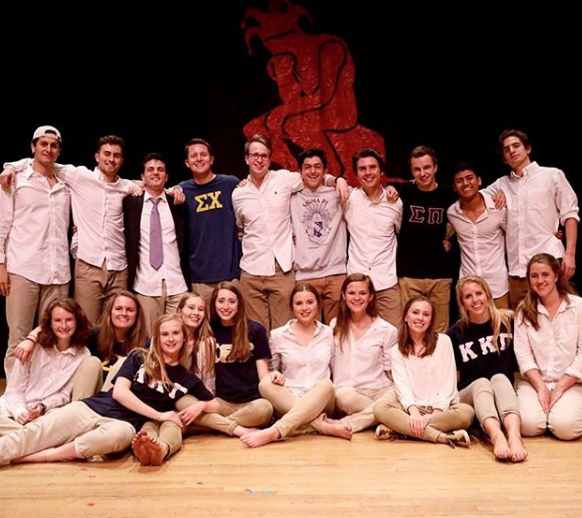 It was founded in 1993 and provides comedic entertainment to Wake Forest’s campus through shows held twice each semester during the school year. As director, Morris is in charge of overseeing the preparations for each comedy show and ensuring that the all of the skits run smoothly. This year, Morris accomplished her goal of increasing the popularity of the Lilting Banshees and selling out all of the comedy troupe’s shows this year. As her most recent and final achievement during her time as director, Morris organized and planned the Lilting Banshees’ last show of the 2019 spring semester on April 10. Why did you decide to become the director of the Lilting Banshees? I was elected as director by the rest of the troupe. We elect every position through a democratic process. This troupe has been such a huge part of my life at Wake Forest, and being director this year has really rounded out my experience here. As director, how did you view your leadership role and what goals did you envision for this year? My leadership role is basically to oversee everything and make sure operations were running smoothly. My goal was to sell out every show I directed this year, and we achieved that. What is involved in preparing for the shows and where do you find inspiration for the skits? We have three writing sessions a week, during which troupe members pitch ideas. The assistant director and I will decide what sketches we write, and we spend about 50 minutes in groups of three writing them. So by the end of the semester, we have about 70 sketches to choose from to put in the show. We then have a day about two weeks before the show called “War Room” where we decide what 12-15 sketches we want in our show. We then rehearse every single day leading up to the show. Inspiration-wise, I honestly couldn’t tell you where some of the ideas come from. People just think of the most random things, and we figure out the best way to make funny sketches about them. What do you believe is the most important aspect of the Lilting Banshees’ contribution to campus life at Wake Forest? I think the most important aspect we bring to campus is that sense of relief from everyday life. When we get together, it’s always fun and we’re able to forget about schoolwork or other life stressors for the time being. Hopefully, when people come to our shows, they feel that too. What is your favorite part of working with the Lilting Banshees, and can you describe a particularly memorable moment or skit? My favorite part is honestly being up there on stage with some of my best friends at Wake Forest. The performances are such a rush, and they will remain some of my fondest memories from college. One of my favorite sketches I’ve ever been in was a spinoff of the traditional Adam and Eve story. I got to play Eve and my character ended up making this huge comment on women’s rights. I love touching on political commentary in comedy. What piece of advice would you give to the next director? To the next director, I just say have fun with it! There were plenty of times that I was really stressed and forgot the whole reason why we make jokes — it’s to have fun.